Moreover, Turner adds, “Ms. Ocasio-Cortez has soared because of the freedom and prosperity her policies would destroy.” It seems a little recherché to attack democratic socialists for neglecting natural law – but it’s no surprise the American Right are still reaching for the idea of freedom in order to rubbish their opponents. Truss makes a truly cringeworthy contrast between “po-faced, humourless socialists banning fun and controlling every part of our lives,” and a young generation of “snapchatting, pop-up-shopping, online-trading freedom fighters.” Nevertheless, these attempts to paint democratic socialists as opponents of freedom don’t come out of nowhere. Might there still be something in them? 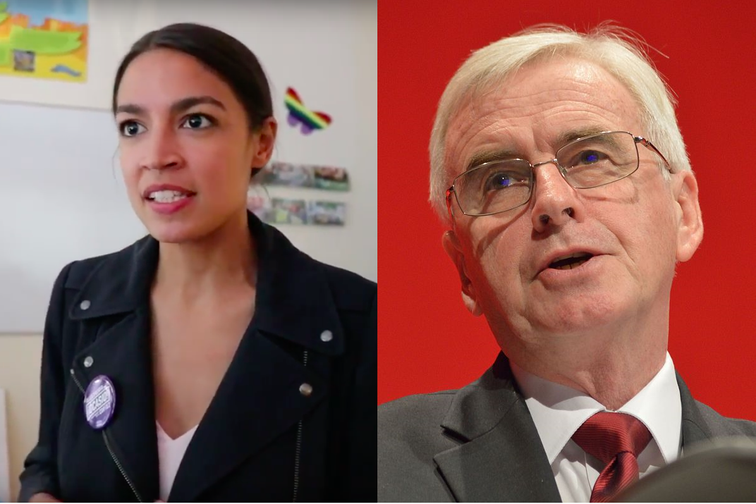 There’s a seductively simple story that makes sense of Truss and Turner’s complaints: capitalism stands for freedom and socialism stands for equality. The socialist desire to share resources equally necessarily requires the dead hand of the state to squash individual initiative and expropriate the fruits of private economic activity. Limiting inequality would mean limiting freedom. We might still be willing to restrict economic liberty if it proves too costly – such as when ‘freedom for the pike is death for the minnows.’ But we ought to be under no illusions that it is freedom that is being sacrificed. The problem with this way of looking at things is the highly dubious understanding of freedom it presupposes. Unfortunately, this conception of freedom has become firmly lodged in Anglo-American political life – shepherded along by influential right-wing think tanks such as the Heritage Foundation and the Fraser Institute. It aligns our economic liberties with untrammelled activity in the marketplace. You are free when no one is stopping you from voluntarily exchanging labour, capital or goods. This market-based view of economic freedom has some grim implications for democratic socialists like Ocasio-Cortez and Corbyn. It suggests minimum wages make us less free by limiting what kind of contracts we can enter with employers. Tyrannical bosses won’t infringe the freedom of their subordinates because these employees have voluntarily accepted their jobs. Workers who cooperatively own their firms or run their workplaces are no freer than those on zero-hours contracts. But something fishy is going on here, and it’s the market-friendly take on freedom that smells rotten. This understanding of freedom as protection from arbitrary social power also speaks to how many people in Britain feel today. West London careworkers complain that they are “dependent on the good will of their employer.” The writer Ivor Southwood observes, “Where I work, doing what and for whom, for how long and how much; all these co-ordinates are arbitrary to the point of absurdity.” He also notes how “the manager increasingly comes to take the position of the customer who must be satisfied, and to whom one has to continuously sell oneself.” We live in societies where civic republican freedom is routinely under attack in these ways. Democratic socialists should once more look to the civic republican conception of freedom if they don’t want to cede the language of economic liberty to the right. A sufficiently retooled and punchy version of this analysis would allow them to beat conservatives and libertarians at their own game. Yes, they should agree, economic freedom is indispensable, but ‘free’ markets and deregulation will never achieve it for us. These simply entrench the unaccountable power of bosses and shareholders, who can turn workers’ lives upside down at a moment’s notice – refusing to renew their contracts, reducing their hours, dramatically increasing workloads, initiating disciplinary proceedings, closing firms completely, or the death-by-a-thousand-cuts that comes with daily exposure to an imperious manager. There is no escape outside of paid work either. For example, even the crumbs provided to people with disabilities and the unemployed by our increasingly punitive welfare state are conditional on the invasive and sceptical judgements of civil servants under pressure to save money, with significant discretion to sanction claimants or stop their benefits entirely. Democratising the economy is not only a way of harnessing the expertise of workers; it also secures many of the conditions necessary for them to assert control over their own lives. Power in the hands of workers and citizens provides a check on the arbitrary authority currently held by managers, owners, and shareholders of firms, who have sweeping discretion to impose their own will on both their employees and society as a whole. Economic liberty thus belongs at the heart of McDonnell’s story. Indeed, democratic socialists should not be cowed by the right in how they present their wider ambitions. They ought to point out how the success of their political project would lead to a massive increase in human freedom.